Natural disasters, workplace violence, and other events require effective emergency preparation and response in the workplace. It is essential to ensure the safety of staff through the awareness of appropriate actions to be taken under various emergency situations. Organizations with offsite facilities that are rented or leased may have personnel working in these locations that are not covered by the disaster planning guidance of their parent organization. A comprehensive understanding of the limitations and constraints that impact effective disaster planning is critical for the care and welfare of all employees. 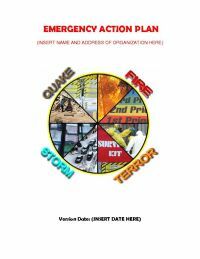 This document is a template "Emergency Action Plan" which also incorporates lessons learned regarding some of these unique issues that offsite facilities may encounter when developing disaster preparation and response plans.